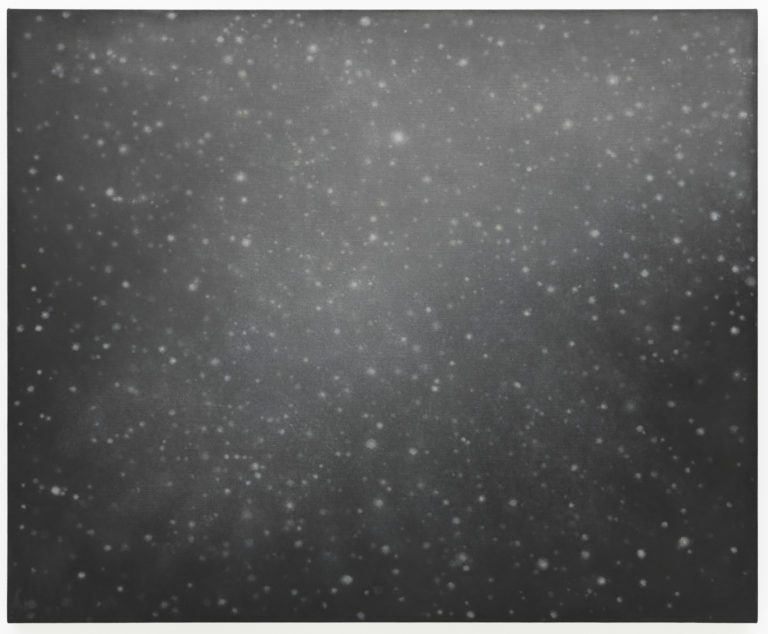 A refugee from Latvia, Vija Celmins came to the U.S. as a child. Her early work reflects her sense of dislocation: an inscrutable giant comb sculpture, a tiny house on fire, WWII bombers, nuclear blasts, a disembodied hand firing a gun, and pencil drawings of satellite pictures of the moon. After moving to Venice Beach, Celmins started to draw and paint from ocean photographs. Night sky pieces follow her travels to deserts in the Southwest. The deep black surfaces are dotted with stars and are layered, sanded, erased, and rebuilt. To Fix the Image in Memory I-XI (1977-82), after which this revelatory retrospective at SFMOMA is titled, pairs river rocks with perfectly duplicated bronze replicas. In her recent installations she couples old-fashioned school blackboards with her identical copies. The wabi sabi beauty found in her sensitive renderings, the use of erasure, repetition, copying, layering, and the discipline of her practice produce something that feels transcendental.